For the digital transformation of a sales department, a fundamental tool is the electronic signature since any online shopping experience that involves signing agreements or contracts, can not be 100% digital without it. We explain 10 benefits of this innovative solution in the next post. 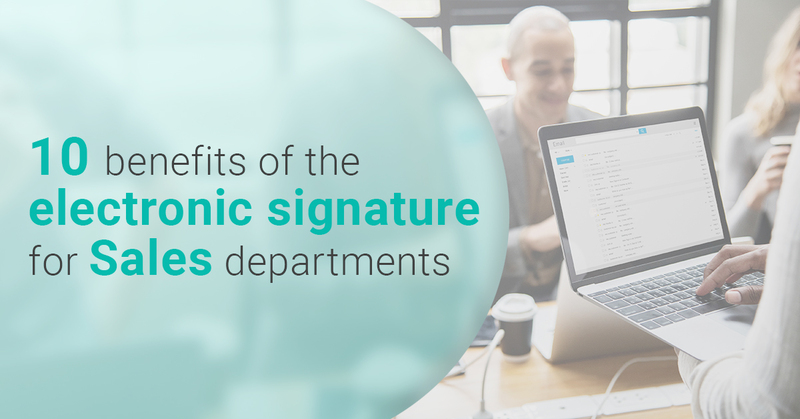 Having a digital tool like Signaturit’s electronic signature means clients can sign a commercial contract practically straight away, at any time, and anywhere. When a client has decided to make a purchase, the electronic signature allows him/her to complete the process from home, or anywhere else, at a time of his/her choosing, on his/her computer, tablet or mobile. Likewise, the ability to sign anywhere on any device removes the problem of distance or the fact the salesperson has to send the contract to the sales director. Contracts can be signed on the same day they are sent to the client, regardless of the number of signatures needed to validate an agreement. Space and time are no longer an issue. Being able to carry out transactions on the spot and quickly (as mentioned above) are two qualities that are highly appreciated by digital clients. Clients appreciate not having to spend time on printing documents, signing them, scanning them, and then emailing them back to the company providing the service or product. And they are even more appreciative of not having to go to an office to complete the process in person. An ink-on-paper signature may lead to errors that prolong the whole process of closing a commercial deal. For example, the client may forget to sign some pages or fill in certain boxes. None of this happens with an electronic signature solution like Signaturit as the process cannot be completed if all the necessary fields have not been filled in. What’s more, once the contract is signed both the client and the company receive a copy: the client receives an email with it and the company can access it on their Signaturit control panel. All documents are centralised on the platform, which makes it easy for other departments (marketing, finance, accounting, and so on) to access them and for the Sales Director to analyse his/her team’s activities. Save time on paperwork and filing as commercial proposals and contracts can be properly categorised and saved digitally. Another advantage of digitising documents is the ease of access offered. Client tracking is easier as the status of sent documents - opened, read, signed - can be viewed on the control panel. Therefore, there are significant time savings on follow up emails and calls. Sales staff can use their time to call other potential clients or make more sales. Travelling is often necessary but when a sales is out of office they should be just as productive as in the office. Thanks to Signaturit salespeople now have the perfect tool to get contracts signed in the client’s office. They just need Signaturit and a tablet. Increased sales team satisfaction. Speed and ease in the much-anticipated formalities (which have often been a job of work) avoids the uncertainty of waiting, which is a morale-boost for sales staff. A new client is another step towards achieving their goals. So an electronic signature tool that makes the sales team’s job easier is essential in keeping them motivated and happy with their work. A pesar de que la firma en papel tiene la misma validez legal que la firma electrónica, lo cierto es que la seguridad que ofrece esta última en caso de un posible litigio es insuperable. Although an ink-on-paper signature is just as legally valid as an electronic signature, the latter clearly offers unbeatable security in the event of litigation. Signaturit’s solution, which is not simply an electronic signature but also an advanced electronic signature, compiles a series of biometric data linked to your signature: geolocation, data on the device used for signing (and, if necessary, we can even include a photo of you, record your voice, or capture an image of your ID document using OCR). The information gathered using these measures forms irrefutable proof of who signed the contract, when, and where, and has full legal validity in court. Using electronic signatures improves the client online shopping experience and also sets you apart from the competition. Likewise, being able to complete the signing of a contract quickly reduces the risk of the client having second thoughts. Electronic signatures offer significant savings in paper costs, electricity bills, and other associated materials such as ink or scanner and printer maintenance. More information: The electronic signature: how much money can businesses save with it? Using the electronic signature does not only mean a tangible economic saving, we can not forget the beneficial impact for the environment that implies the significant reduction in paper consumption derived from the digitalization of the signature processes.